Letting runs Saturday to Saturday. 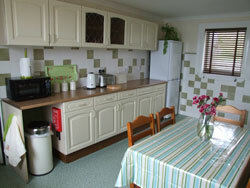 Short stays available from October to March - min 3 nights - please enquire for details. 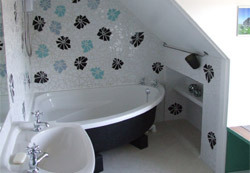 • Bathroom (upstairs) with Electric shower over bath and shaving point. �0 deposit by cheque with balance due 8 weeks before commencement of stay. Bookings made less than 8 weeks before arrival payable in full at time of booking. More than 8 weeks before -deposit forfeited. Less than 8 weeks before -full rental cost incurred. PETS - Please advise us if you intend bring a pet. Pets not allowed upstairs or on sofa. Please clean up dog mess from garden and please keep dogs under careful control around local livestock and wildlife. Please do not leave pets alone in house. Please leave house clean and tidy on departure. If property left in an unclean or inappropriate manner then an extra cleaning charge will apply. No smoking inside house. Maximum 5 people to stay in house. Please report any damage/loss as soon as possible. Any damages/losses may be charged in full. Pets are welcome in our cottage.